Having troubles with your gutters lately? They are overgrown, leaking or clogged, which prevents them from carrying off rainwater away from your walls and property’s foundations? It seems like it’s about time you call our company as we are the first-choice gutter cleaning provider for hundreds of customers in Earls Court and the boroughs around. People opt for using our services because they are easy on the budget, flexible in terms of scheduling, and carried out in accordance with the established standards of this trade. We have invested in professional gutter cleaning equipment which enables us to clean customers’ gutters and downpipes promptly and efficiently. Don’t put off cleaning your gutters and downpipes any longer! Such negligence will end up costing you a small fortune as it may lead to severe water damages to your property. 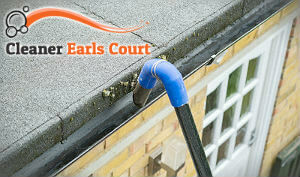 The gutter cleaning service we provide across Earls Court, SW5 is so competitively priced, anyone can afford to use it. More importantly, we can dispatch a team of experts at a convenient time to estimate your gutters free of charge and give you an accurate and fair quote. If you agree with the pricing we have set, we will proceed with the cleaning itself. Provided that our operatives have encountered any blockages during the inspection, they will clear them out with a powerful wet/dry vacuuming system. The team also implements extendible carbon-fibre poles to see inside the downpipes. We can even provide pictures of the final results as we have a camera attached to the poles. This way, you can be safe in the knowledge your gutters are properly cleaned and will serve their purpose. Booking us for regular gutter maintenance is a good idea, first of all, because we offer special discounts for our maintenance packages. Then again, your gutters will be in top shape year-round. 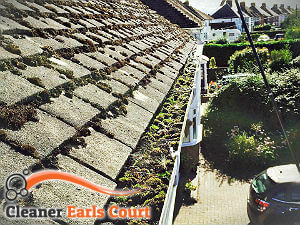 Become one of the many happy customers who have benefited from our specialist gutter cleaning service!